BitLicense is the common name for the license issued by New York State to cryptocurrency businesses. It was the first and, at least until mid-2018, only license or registration for cryptocurrency exchanges and brokers in the U.S. The rules apply both to New York resident persons and entities and to persons and entities out of state that conduct cryptocurrency business with New York residents. On June 24, 2015 the New York State Department of Financial Services published a set of rules called "Virtual Currencies," the application of which results in a so-called BitLicense that can be granted by the department. The New York BitLicense is comprehensive. It applies to all persons in New York State or doing business with New York State persons from another location. It covers a wide range of activities including transmission of cryptocurrency, holding cryptocurrency for others, buying and selling cryptocurrency as a customer business, providing exchange services to customers, and issuing cryptocurrency. 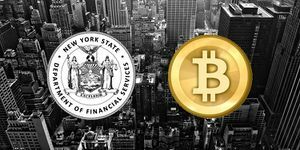 New York State-chartered banks are excepted from the rules if they have previously received specific appropriate permission from the Department of Financial Services to engage in cryptocurrency business activities. Exempted also are persons simply making or receiving payments in cryptocurrencies, participants in customer affinity programs that award tokens, and software providers which do not handle or hold cryptocurrencies for customers. Any entity or individual who wants to conduct a cryptocurrency business in New York must apply to the Department of Financial Services and provide extensive information about the its own business and that of its affiliates, detailed biographical information about all key people along with an independent investigatory report, financial statements, banking details, copies of written policies and procedures. As of May 17, 2018 five firms had been approved as BitLicensees: Circle, XRP II, Coinbase, Bitflyer and Genesis Global Trading. ↑ New York Codes, Rules and Regulations. New York State Department of Financial Services. ↑ Bitlicense Regulatory Network. New York State Department of Financial Services. ↑ New York’s Final “BitLicense” Rule: Overview and Changes from July 2014 Proposal. Davis Polk. ↑ NY Grants Fifth-Ever BitLicense to Genesis Global Trading. Coindesk. ↑ NYDFS GRANTS CHARTER TO “GEMINI” BITCOIN EXCHANGE FOUNDED BY CAMERON AND TYLER WINKLEVOSS. NY Department of Financial Services.